Platelets are fragments of blood cells that occur in the blood of vertebrates and are associated with blood clotting. Scientists have made great strides in recent years in understanding what stimulates platelets to form blood clots at the molecular level and in developing drugs to inhibit platelet action. Their work has a direct effect on millions of people who deal with cardiovascular disease, strokes, surgery, physical trauma, and other conditions. While references to platelet function have been included in some large texts, there has not been a basic reference manual that researchers and clinicians can use in their daily work until now. 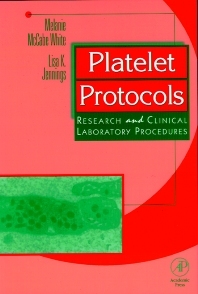 Platelet Protocols fills the need for a straightforward and comprehensive laboratory manual on current procedures for evaluating and analyzing platelet function and abnormalities. It is an easy-to-read, understandable resource which can be kept at the bench and referred to frequently by scientists, clinicians, and laboratory staff involved in platelet related areas. Topics range from the basics of anticoagulants to the latest developments in platelet testing. Researchers in cell biology, hematology, and physiology; all clinical laboratories; physicians; medical and other graduate students. Basic Introduction to Platelets: Introduction. Platelets in Hemostasis. Membrane Surface Proteins. Events Associated with Platelet Aggregation. Agonists. Coagulation. Laboratory Evaluation of Platelet Function: Introduction. Variables. Drawing and Processing Blood for Platelet Aggregation. Platelet Aggregation and Secretion. Platelet Agonists. Clot Retraction. Functional Abnormalities of Platelets: Introduction. Storage Pool Disorders. Release Defects. Glanzmann's Thrombasthenia. Von Willebrand's Disease. Bernard Soulier Syndrome. Bleeding Time Prolongation. Therapeutic Approaches to Inhibition of Platelet Function and Pharmacodynamic Evaluations: GPIIb-IIIa Antagonists. Other Anti-Platelet Therapies. Drugs That May Affect Platelet Function. Appendix: Recipes for Citrate Based Anticoagulants. Inhibitors Used in Platelet Techniques. Cytoskeletal Preparation and Recipes. Gel-Filtered Platelets. Washed Platelets. Western Blots of Acrylamide Gels Gell and Blot Recipes. Staining of Platelets for Flow Cytometric Analysis. Subject Index.